New Trier was ready to break it open, already leading 2-0 in the 2019 Illinois High School Hockey Girls State Championship Game, played March 22 at the United Center. Sabrina Shvartsman and Ella Huber each tallied for the Trevians, who were looking to stop No. 1-ranked Fenwick, a co-op club representing Fenwick, OPRF, Trinity, Guerin Prep and York. 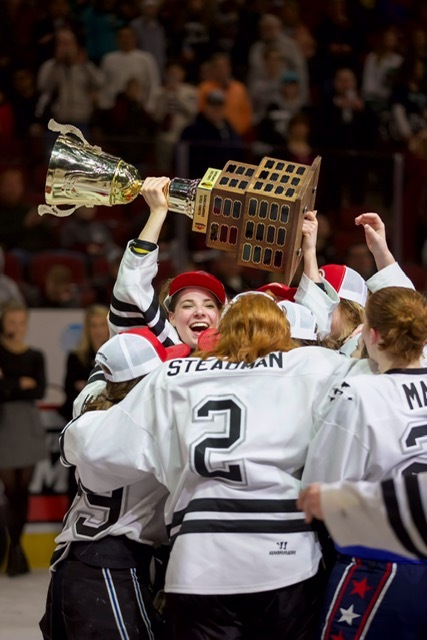 Fenwick then scored three unanswered goals to capture the state title, 3-2, marking the first girls’ high school hockey state championship in school history. “Definitely, everyone is elated,” Strom said. 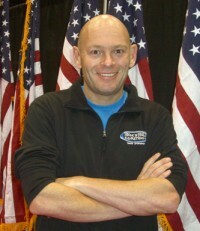 “I was really proud of the team. I thought we were the best team this year, and am glad we were able to prove it. Fenwick broke the ice at 4:47 when Erin Proctor scored off an assist from Ellie Kaiser. Kaiser tied the game less than 2 minutes into the second period, converting a penalty shot. She then tallied the game-winner on assists from Simone Bednarik and Caroline Jenkins with 3:30 remaining in the third period. “The girls will never forget this season, this championship, especially the seniors. Strom said the championship game win over New Trier was helped by a regular-season tie against the same Trevians. 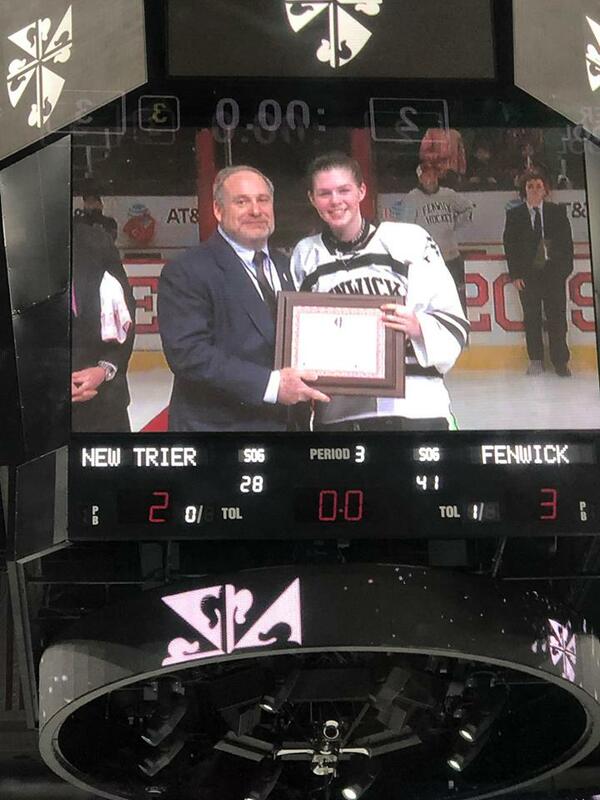 First-place in Metro Girls was on the line in that game, and Fenwick trailed 3-2 late in the game, so they pulled their goalie for a sixth skater. The game ended tied, 3-3. “That was a critical game for us … we got this mentality from that game that no one can beat us if we play as a team and worked together,” said Strom, who noted that Fenwick also was quick to recall its state semifinal loss last season. And Kaiser converted the one penalty shot she really wanted to. Strom said that congratulations have been coming seemingly nonstop since Friday night, including from former Fenwick two-time Red Division state champion Nick Fabbrini, now coaching the University of Illinois men’s hockey team. Fenwick is planning a pep rally for the team, but they want the entire team to attend and participate,” meaning, players from all schools, Strom said. ‹ Congratulations 2019 NWHL Champions!